Send To Toys 2.71 free download. - Send To Toys Control Panel Applet allows you to manage the Send To system menu content, and configure Send To Toys settings. - Send To "Command Prompt" opens a DOS console window, setting the current directory to the selected folder. If the selection was a file, the folder containing the file will be the active directory and the name of the file will be typed for you at the prompt. Hold down the CTRL key to change the active directory to a different folder. - Send To "Folder..." sends a file or files to another folder, you will be shown a dialog box that lets you choose where the files should be copied. To move the files press and hold down the SHIFT key. The creation of a new folder is not supported on Windows 95, 98, and NT. - Send To "Recycle Bin" send a file or files to the Recycle Bin. 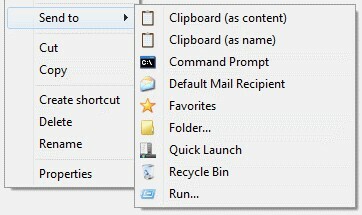 Hold down the CTRL key to perform a file shredding.